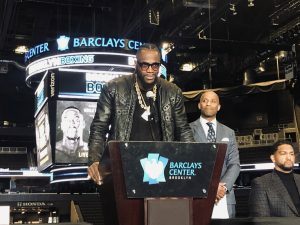 With these words, Showtime honcho Stephen Espinoza made it loud and clear that WBC heavyweight champion Deontay Wilder would rather fight on Showtime than he would on the DAZN streaming service, which had reached out to make a deal with the Alabama native. And so, on Showtime, Wilder will face Dominic Breazeale on May 18th at Brooklyn’s Barclay’s Center. Many had expected Wilder to have a rematch with Tyson Fury this spring, as the two men had fought to a controversial draw last December. Fury, however, signed with Bob Arum’s Top Rank Promotions, and will now be fighting on ESPN, Showtime’s competition. As for DAZN, a deal with Wilder might have led to a heavyweight superfight with multibelt titlist Anthony Joshua. Team Wilder found the offer unfair, however. As for Breazeale, the man had a searing run in with Wilder in a hotel lobby some time back. It was an incident the California native made clear motivates him. “I didn’t have an urban dictionary,” Breazeale said of the melee, “so I couldn’t understand what he was saying.” Wilder, too obviously remains heated over the matter. “I can’t wait to see what this dude’s body gonna do when I hit him in the face,” he said of his opponent. Wilder jawed throughout the standoff while Breazeale simply stared at his opponent cooly. Wilder then appeared to stalk after Breazeale offstage, yelling the entire time. “Boy,” Wilder had said earlier. “I’ve been waiting for this day.” He certainly seemed to be enjoying the moment. Word had been out that the Wilder-Breazeale fight would go down on Showtime pay per view, so the fact it will air on regular Showtime this spring may come as a surprise to some.